Neighborhood Choice: ON THE WATERFRONT . . . coming 8/26! It’s hard to believe but this tuesday is our final film of the 2014 series– and it’s also the one that you, the audience, voted for! 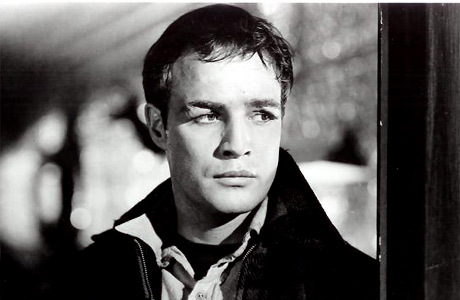 Our Neighborhood Choice this season is Elia Kazan’s 1954 classic ON THE WATERFRONT. Set in Red Hook, but filmed in Hoboken, ON THE WATERFRONT is based on a series of Pulitzer-Prize winning articles by Malcolm Johnson that examined the crime-riddled world of the New York docks. The film stars Marlon Brando as the once-promising boxer Terry Malone as he attempts to stand up to his corrupt union bosses, and also features Karl Malden, Lee J. Cobb, Rod Steiger, and, in her big-screen debut, Eva Marie Saint. It was nominated for a dozen Academy Awards, and won eight, including Best Picture, Best Director, Best Actor for Brando, and Best Supporting Actress for Saint. ON THE WATERFRONT is brought to you by MOVERS NOT SHAKERS and RED HOOK LOBSTER POUND, who will be serving their extraordinary lobster rolls (both Connecticut and Maine styles–$16), Red Hook Dawgs ($4), and Cape Cod Chips ($2). Plus as always, Steve’s Authentic Key Lime Pies will be open late across the parking lot and selling their tarts, pies, and swingles, King Leche Cremes will be on hand with their hand-crafted goats milk ice cream, and Heba Deli will be serving beverages. So come on down and celebrate the end of summer in style! ← INDEPENDENCE DAY . . . coming 8/19!